We're a plumbing company offering the best of both worlds: the versatility to handle most types of plumbing task with the professional expertise to complete them properly. Whatever your plumbing requirement - whether it's a simple unblocking of the kitchen sink to a full new boiler and central heating installation - we're more than capable of handling it. We're fully experienced and qualified in all aspects of plumbing and related tasks, so we're likely to be the only plumbers you'll need whatever your requirements. We've built an enviable reputation throughout Lymm over the years for providing a wide range of plumbing services to many satisfied customers. See for yourself why we're so popular by getting in touch now to discuss your requirements, and see how affordable we could be by asking for a free estimate. The above is a selection - please ask if your requirement is not listed. 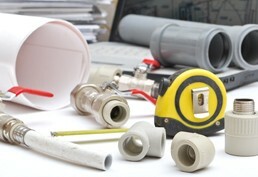 The convenience of using a fully experienced full service plumbers need not be expensive. We think you'll be pleasantly surprised at how cost-effective we'll prove. For example, we don't charge a call out fee if you need an emergency dealt with and, of course, we'll always provide an estimate for all work. Talk to the versatile plumbers serving Lymm now on 01925 204955.